We custom make all of our paracord bracelets, So they are crafted just for you. They are made out of genuine USA manufactured 550 paracord. The bracelet is a great way to carry around a length of paracord for any emergency that comes along. To use the cord, simply unbraid the bracelet. Each bracelet has between 2 and 3 metres of cord depending on your size. 550 paracord has 7 inner strands which have a 25kg tensile strength. The outer sheath is rated at 256kg. The inner cords can be used for fishing line, sewing repairs, lashing, snares, or any number of uses. When measuring for the size of your wrist, use a tape measure to wrap around your wrist tight then measure that length. DO NOT ADD ANY EXTRA LENGTH WE WILL DO THAT. Also e-mail us at info@milspec550.com.au with any questions you may have. 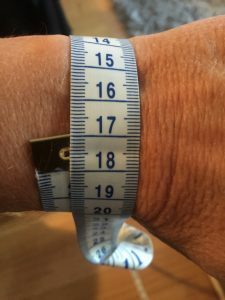 To get the perfect fit, measure your wrist at the wrist bone utilising a standard (soft) measuring tape. See graphic for illustration. If you do not have a soft measuring tape, wrap a ribbon around the wrist at the wrist bone, mark the spot where the ends meet, then lay the ribbon against a ruler to determine approximate wrist size. WE WILL MAKE SURE THAT WE ADD ENOUGH SLACK SO THAT THE BRACELET IS NOT TOO TIGHT.